I was listening to the radio the other day when the DJ announced the results of their unofficial Halloween survey. The topic was: What are the Top 10 Scariest Halloween Movies of all Time? The answers weren’t exactly what I was expecting. Okay…what I want to know is: how on earth did The Exorcist come in at #9??? 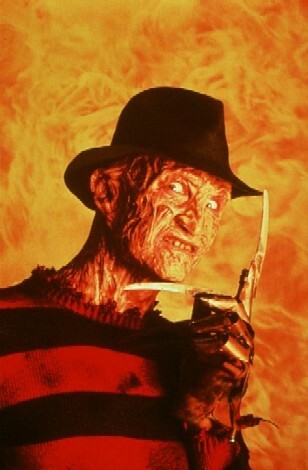 That movie freaked me out FOR YEARS! Likewise, The Omen messed with my head for far longer than I ever thought it would. And while I know from talking to my mother that Psycho was a truly scary, terrifying movie back in the prehistoric era—and it belongs on a scary movie list—there’s no way I would’ve ranked it as the scariest movie of all time. I never thought The Shining was scary. Creepy, sure. Jack Nicholson axing his way through the door was kind of funny. But scary? Nah. Likewise, The Blair Witch Project did not scare me at all. 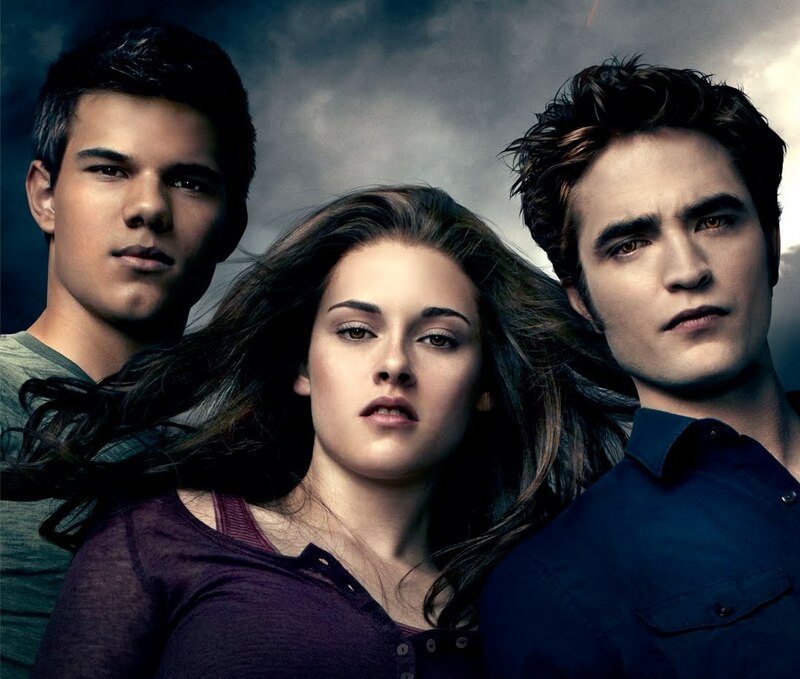 Speaking of movies that were funny and not necessarily scary, no Halloween post would be complete if I didn’t mention the phenomenon that was the Twilight series. Right…until my younger daughter encountered Twilight. Oh geez. Here we go again. 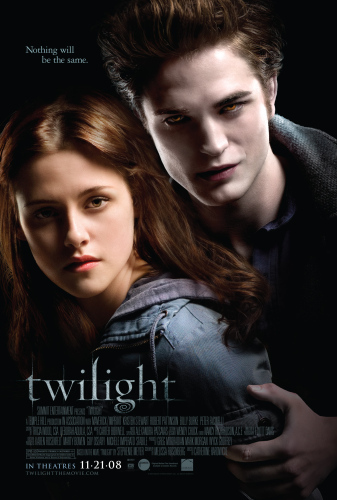 I discussed this movie in some detail in my blog post Valentine’s and Vampires, but I still find myself wanting to understand more about Edward Cullen. Why do young women (and older women who should know better) love him? ME: So, Edward, thanks for coming here. I know how busy and tormented you undead folks are, so I really appreciate it. EDWARD: Certainly. I understand how much it means to ardent Twi-Moms like you. ME: Um…yeah. 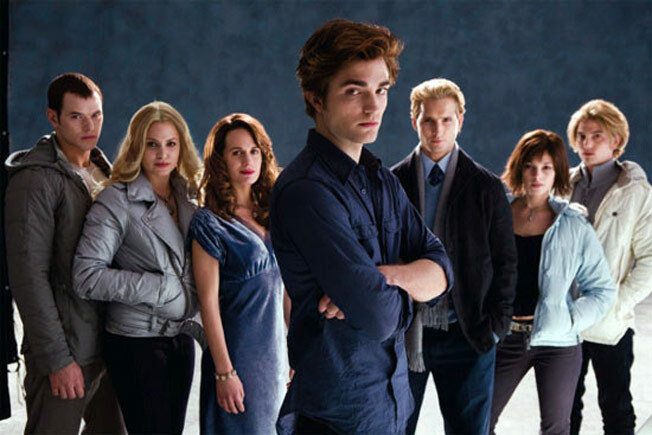 So, are you mad at your “father,” Carlisle Cullen, for making you a vampire? EDWARD: Yes and no. Yes, because I kind of think it crosses the boundary of patient/doctor relationship. I mean, I was dying of the Spanish Influenza in 1918. Don’t you think maybe I would’ve preferred dying to being undead? I’m just sayin. And then again, no. I really love being a tortured, undead person forever and ever. ME: Really? Don’t you ever get sick of being 17? EDWARD: Well, maybe a little. I mean, I am sick of going to graduations and listening to the valedictorian. You’d think I’d get at least one shot at being the valedictorian myself—I mean, I’ve had over 90 tries at it—but NOOOOO. ME: You’ve got to be pretty sick of the prom, right? I mean, I only went to one and that was enough. EDWARD: I know, right? Except my vampire friends tend to keep things interesting. EDWARD: Well, there was this time that my vampire pal, James, crashed the prom and killed all the chaperones. Ha, ha, boy was that a fun prom. We had a keg and everything! Or the time that my vampire brother, Jasper, cried because he wasn’t voted Prom King and he killed everyone! Boy, those were some good times. ME: So, I guess you were not surprised when Victoria showed up and started to plot Bella’s death at the prom? EDWARD: Oh, I knew she was there. One of my undead abilities, in addition to glittering in the sunlight, is a very keen sense of smell. So I knew Victoria was hanging around. ME: What does she smell like? 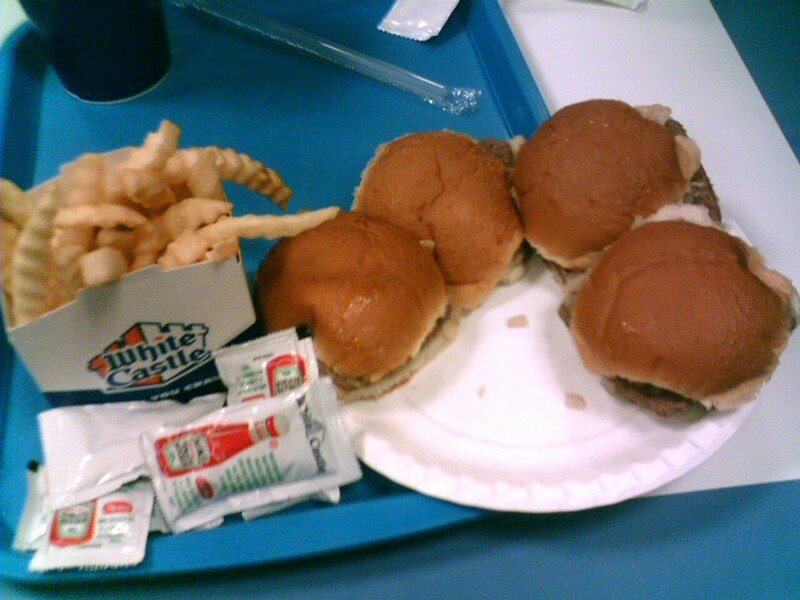 EDWARD: White Castle. You can smell her from miles away. ME: But when you caught her smell, weren’t you worried about Bella? EDWARD: No, at first I was just hungry. 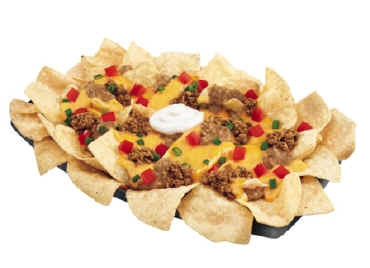 It’s what I crave! ME: But what about when you realized it was Victoria? EDWARD: Oh, yeah well. Once I knew it was Victoria, I was kind of disappointed. But then, I was kind of glad. The truth is, that night Bella was a drag. I kinda wanted Victoria to kill her. I mean, she didn’t even compliment my tuxedo. AND what was with those clunky shoes? ME: She had to wear those shoes since James tried to kill her…because of you. EDWARD: Oh sure, get technical. Anyway, I can’t go to the prom with the same human every year! Plus I couldn’t really bust a move because James broke her leg. So that meant that I had to be all romantic. Yuck. ME: Okay, moving on…. I need to know something. How exactly did you realize you glitter? EDWARD: Funny story! I was still eating humans at the time (it’s a really hard habit to break. Sort of like smoking, or playing Candy Crush Saga). Anyway, I was tracking this big fat guy who would’ve held me over for days when I stepped out into the sunlight. All of a sudden, I had 40 humans pointing at me screaming, ‘He shimmers! He sparkles! HE MUST BE RADIOACTIVE!’ Of course, that was when I lived on Love Canal, so I wasn’t the only one. ME: You mean they didn’t realize you are a vampire? EDWARD: What the hell kind of vampire did you ever hear of that shimmers? Most of the vampires I’ve met spend their days lounging in a coffin because they’ve got this Goth thing going on. But me? I had to have a vampire Dr/Dad from a beach town! He was totally into sunshine so now he glimmers in the sunlight instead of burning or tanning. And now every vampire he’s ever made does too! ME: Is that why you skip school so often? EDWARD: No! I’m working on my valedictorian speech. I’ve taken Intro to Statistics 95 times, and I can tell you that the odds of my becoming valedictorian get greater and greater every single year. ME: Now that you have 95 diplomas, why don’t you just go to college? Or maybe get a job? EDWARD: Well, my Dad says that people in college ask too many questions. Like, say I had to share a dorm room with 3 other guys. They might wonder why I never sleep or eat or drink. Plus, my 95 framed high school diplomas might give me away. ME: But you could still get a job. EDWARD: I had a job once working the late shift at the Taco Bell drive through. EDWARD: I was forced to quit after I ran after a carload of diners and dashers. ME: Oh no! Did you kill them? EDWARD: No, I gave them their Nachos Bell Grande before I realized that they never paid me. My boss got so mad he threatened to make me clean the walk-in-freezer, so I quit. I mean, that walk-in freezer is SCARY! ME: All righty…let’s move on. Does Jacob threaten you? Are you afraid that one day Bella might leave you for him? EDWARD: Well, I was in the beginning. But then I realized how much she loves me when I inexplicably broke up with her in the middle of a forest and left her laying there for days, despite the fact that Victoria was looking for her and meant to kill her. I mean, if that’s not love, what is? ME: Don’t you think that was kind of…stupid? EDWARD: Possibly, but when you’re a 112-year-old vampire, you see humans do lots of stupid things. EDWARD: Let’s take Bella’s dad, for instance. He’s a cop that never seems to realize that his population of 100 people consists of about 98 vampires and werewolves. So, he and Bella are the only people who aren’t actually dead. Doesn’t that seem stupid to you? ME: Sure does. But what kinds of stupid things have you seen Bella do? 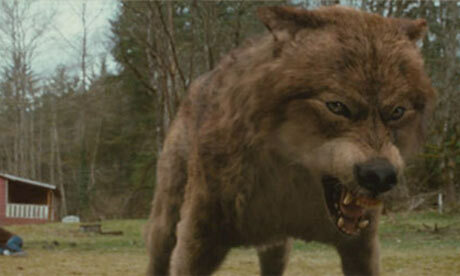 EDWARD: There was the day she went to the gym wearing her “Team Jacob” tee shirt. She thought it was hilarious, but it took a dozen silver bullets and an entire box of milk bones to get rid of Jacob. ME: That does sound pretty dumb. Say, young girls really seem to love you. Can you explain why? EDWARD: It could be the horrible way I treat Bella. Chicks dig that. Or it could be that I’m insanely jealous of that dog she hangs out with. ME: Do you mean Jacob? ME: Are you saying that you and the dog can talk to each other? EDWARD: Yes and no. Pepita is from Tijuana, so her accent is hard to get sometimes. But mostly, yes. ME: Okay! Look, I know you have a lot of important, undead-related activities to attend to, especially with Halloween right around the corner. EDWARD: No problem, I’ve got all eternity! Ha, ha, ha. Little vampire humor there for you. ME: Right! So if you could share the most romantic things you’ve ever said or done to win Bella over, what would they be? EDWARD: Yes. Remember, when romancing a young lady, make sure to take her to fancy places like Rome. Introduce her to your friends, even if doing so can end up with her being killed by a weird Vampire council. Next, promise her a beautiful wedding on a lush tropical island. Make sure you leave out the part about impregnating her with your demonic half-vampire spawn, though. It kinda ruins the fantasy. Promise you will fight to the death for her no matter what. Then kill her. This way, she and your demonic half-spawn can fight too. Accept her friends, no matter how much you might like to kill them. This one is true even for non-vampire relationships. Just remember to insist that they keep their shirts on, get de-clawed, and go for weekly flea dips. ME: Unfortunately, that’s all we have time for. Thanks for answering my questions, Edward. EDWARD: My pleasure! I haven’t had this much fun since World War I! ME: That’s it, folks. Next year, I’ll try to interview Bella if and when her undead schedule permits. 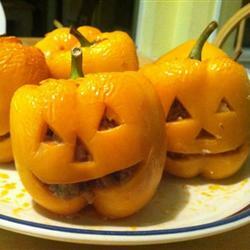 This recipe looks easy to make, got great reviews, and is a scream! 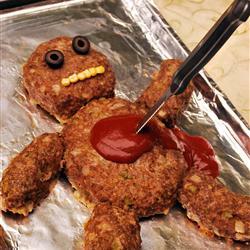 I forgot to ask Edward if he likes meatloaf, but it looks good to me. So, Hungry Lifers: which movies are your scariest Halloween picks? 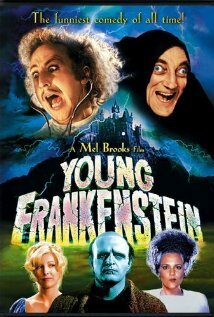 Funniest Halloween movies? If you could ask Edward Cullen one question, what would it be? Please leave your comments below, and let us all know. Thanks! I’m guessing I would ask him if he wanted to make out. After that I would ask him why there even was a team Jacob. One of the movies that freaked out my sister and then me was When a Stranger calls. I remember when she first saw that movie she wouldn’t sleep by herself which I loved because she needed me. This was BIG since she hated me. (don’t worry, she loves me so much now). I recently watched it again and all I wanted to shout was, grab your cell and call for help! I think Edward would really like you. Maybe he would invite you over for their next game of softball or make you a part of his vampire family. Oh I have a story about When A Stranger calls…but I’ll save that for next week’s post. Technically, it wasn’t a movie, but The Trilogy of Terror made-for-TV movie starring Karen Black totally freaked me out! I know it did the same for you, Maria! Of course it didn’t help that it was always on at one in the morning when everyone else was sleeping and the house was pitch (karen) black! I was thinking the same thing, Lisa! That Zuni doll was awesome! And don’t forget “Don’t Be Afraid of the Dark” with Kim Darby, that was a creepy one also. That was super creepy. Also Children Shouldn’t Play with Dead Things and Night of the Living Dead. I lost a lot of sleep over those two. Oh yes, Trilogy of Terror WAS TOO A MOVIE! I can remember sitting up late on a Friday night because I’d noticed Trilogy of Terror was gong to be on the late night movie in the TV Guide. Chris and I would sit there through the first two “tales” and then wait for Karen Black to smack that doll down, shaking the medallion loose…and then the fun would begin. I was sorry to hear that Karen Black died recently–we thought she was the greatest. I would have put “The Exorcist” at #1. “Psycho” was scary enough to make me think of it every time I’m taking a shower in a hotel!! I’d also add (the original) “When a Stranger Calls” — for anyone who’s ever been a babysitter. And I’m still scared to go into the ocean, so put “Jaws” in there too. As far as scary TV, why have they NOT EVER rerun “Trilogy of Terror” (with Karen Black)?? That was AWESOME! You are the second person to mention When a Stranger Calls–I remember it too. I have a story about that one, which I will share in a future post! I thought about adding Jaws, but I’ve already had that on a few of my top movie lists. I love it every time. The theme song can get my heart racing like crazy. And Trilogy of Terror was always awesome! Thanks for the comment and for reading my blog. Maybe I’m just getting older but one of the scariest movies I have ever seen, Halloween or not, was “Yours. Mine and Ours”. Maybe it is because I actually lived through the nightmare of raising seven kids with all their friends or like I said maybe it is because I am getting somewhat older. Speaking of scary movies I remember Lon Chaney Jr. as the wolf man and in a Abbot & Costello movie was in the same cell as they were, every-time they mentioned something like “Niagara Falls” Lon Chaney would say “And Slowly I turned” and grab the fat one and beat the hell out of him. It sort of reminded me of my mother whenever I did something wrong and she’d get this wild look in her eyes and quickly she turned and beat the hell out of me. But I digress. Very funny post even though I have never seen the twilight series. The fact of the matter is the last Dracula movie I have seen was “Blackula”. Now that was a scary one! Lon Chaney Jr. as the wolf man terrified me as a little kid, but I always looked forward to that Abbott & Costello movie. I would look for it every Sunday morning at 11:30, when they ran the A&C movies. The Wolf Man, Count Dracula, Frankenstein…I was transfixed AND terrified at the same time. I agree…”Yours, Mine and Ours” is pretty terrifying. I’m not sure I could’ve handled another 12 siblings, even if Henry Fonda and Lucille Ball were my parents. I’m with you on The Exorcist for sure. But it’s great because it’s also a superbly crafted film! 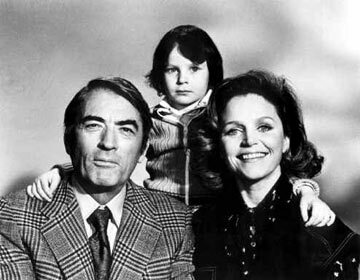 The Omen I saw in the theater at 9, which most people say “explains a lot about me”–and I loved it! I would certainly put the original The Evil Dead up there. And Freaks, which is a bonafide classic! I know it’s a great movie, but I cannot watch it. Too scary for me still! My parents would have never taken me to see The Omen because I would’ve never slept again AND then I would’ve been annoying them every night. Thanks for the other movie suggestions–are you surprised I’ve never seen either? Maria, The Blog goes in two directions. The one about Halloween movies left off too soon. I understood the Twilight references but someone who does not know the series might be baffled as to what is going on. I guess they’ll have to read the books or rent the movies. When it comes to rating movies I think it all depends on when they came out and if the technology at that time is new. My kids think nothing about how great Star Wars is because they see the special effects on TV every day. 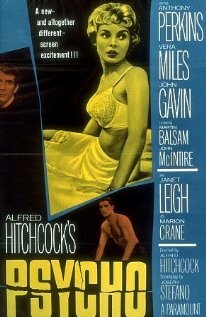 Psycho was spectacular in its day. The Excorist still bugs me out and I refuse to watch it. When I see commercials about that movie it brings me back to the drive in theatre with Kathie, Ronnie, Laura and Bob Mcque getting scared all over again. Now with all the Vampire, werewolf, rombie, ghost shows on television/Cable it takes a lot to scare people. There are even shows that show how these shows were/are made. It takes the scare out of them. Tony, I don’t know what’s scarier, The Exorcist or some of the people you saw it with. Ha ha ha. Last year’s Halloween post was an in-depth look at some scary movies. I couldn’t resist “talking” to Edward this year!